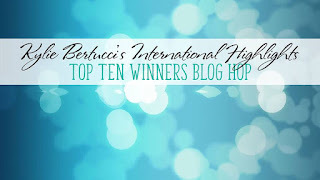 Hello and welcome to my blog for the second post today; I am here with you this time for Kylie's International Highlights Top Ten Winners Blog Hop. This month's theme was encouragement and I can not think of anything more encouraging as a simple thank you. 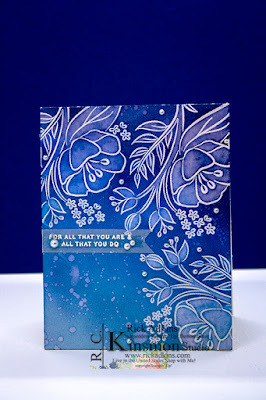 My card features the All That You Are Stamp Set and a fun easy technique that's called Watercolor Bleaching. Here's a look at my card. 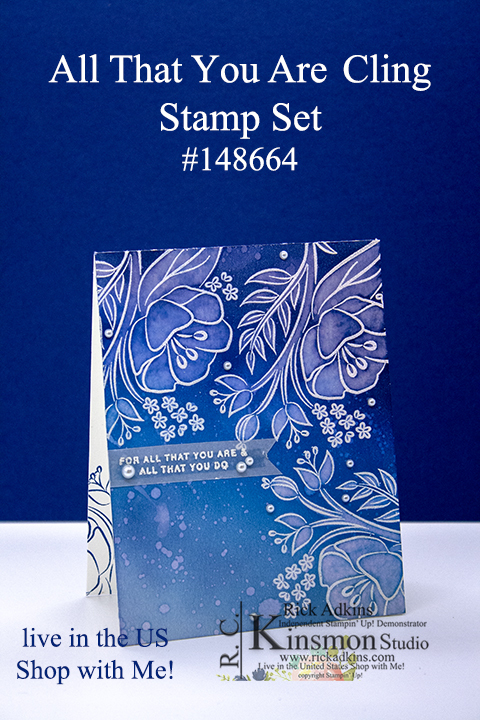 To create this card all you have to do is a little heat embossing and then ink blend over it. 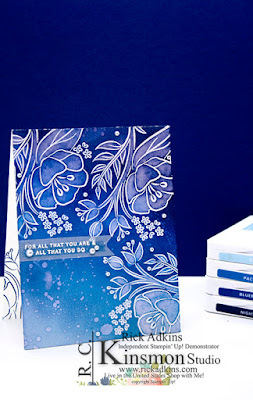 So I started out with the large stamp from the All That You Are stamp set and versamark ink and heat embossed it in white embossing powder on Whisper Whiten cardstock (4 1/4 x 5 1/2). Next I did my ink blending using four different shades of blue. I used Balmy Blue, Pacific Point, Blueberry Bushel, and Night of Navy inks in that order to create a gradient look. Once I had all the ink blending done I used a paper towel to rub all the ink from the embossed areas. After I made sure all the ink was dry I then came in with a watercolor brush and just pain old water to left the color from the areas I didn't want it. This is what gives the bleach effect. A little trick is if you load the area with a good bit of water to begin with and flow it out to the other end and let it just a few minutes, you get better results. Then you take a paper towel and blot off the water. You then continue to work around the images in the same manner. As your working the areas that you started out in will get a little lighter as it dries. It's not going to pull all the water up but it gets enough where it leaves a beautiful result that is very reminiscence of the bleaching technique without the smell of household bleach. I told you that this was a super easy technique and looks so cute when done. To finish off the card I added a sentiment heat embossed on a strip of vellum and added it to the card with a little tear and tape. then added the card front to a whisper white thick card base (4 1/4 x 11 scored at 5 1/2). Thanks for dropping by for my second post today. If you need any of the products you've seen today you can order them in my online store. Make sure you hope along the blog hop you will find the blog roll below unless you're on my WordPress site. 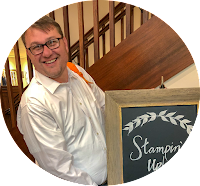 If you're viewing this post there you can click here and go to the blog roll. Wow! This card is a knock out! Great technique! You do such amazing work, Rick! Well done!! I love it! Amazing card! Thank you so much for your tutorial! Beautiful card, Rick!!! I really love this technique and I will be trying it for sure. Glad to hear your brother is doing well. Thanks for sharing this with the awesome video. 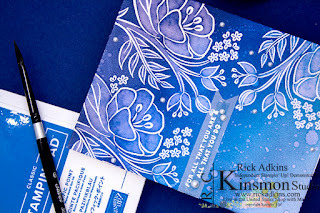 Fabulous card Rick., interesting technique and I love all those blues. Glad I read your blog today. Great technique Rick. This card is stunning! Congratulations on being voted into the top ten. It has been awesome hopping with you! Love your card! The blues are just beautiful. This is a beautiful card! Thank you for sharing it and the tutorial! I love the blues and I would never in a million years thought of this amazing combination! I am in awe of your creative mind!! Awesome card - awesome video. You do such a great job. 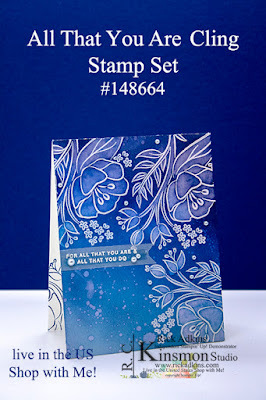 I loved this stamp set from the moment I saw it in the catalog, but even though it's on the first page, I think it gets overlooked. Love that you picked this set for your technique! This is so beautiful. Thank you for the video.